August is one of my favorite months, not only because it is my birthday, but also because it is warm, yet not too hot (okay, this year is an exception) and it is so relaxed, I feel August is the month when people finally get into real holiday mood. When they were finally able to let go of things and focus on the present. So I decided to make an easy cake with my favorite chocolate chip cookie recipe. 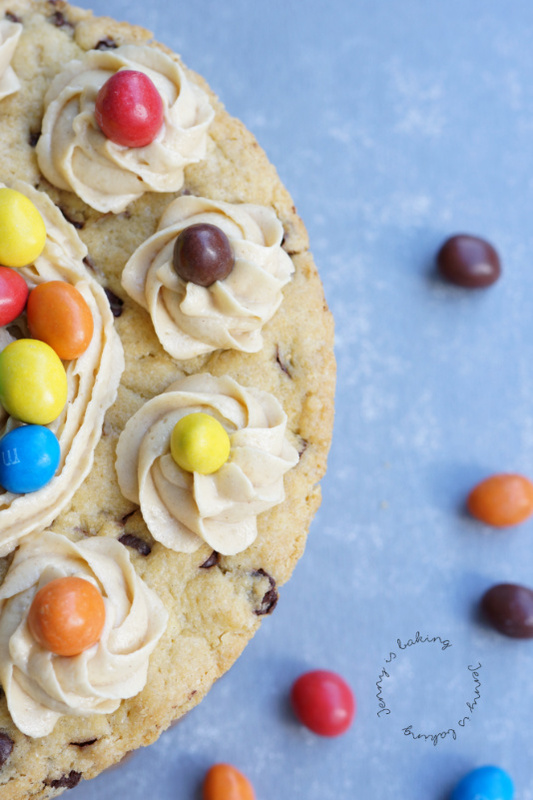 This is a chocolate chip cookie cake. Or a chocolate chip cookie in cake form. I got this idea from Sally, my heroine. Sally actually invites to take part in her monthly baking challenges. 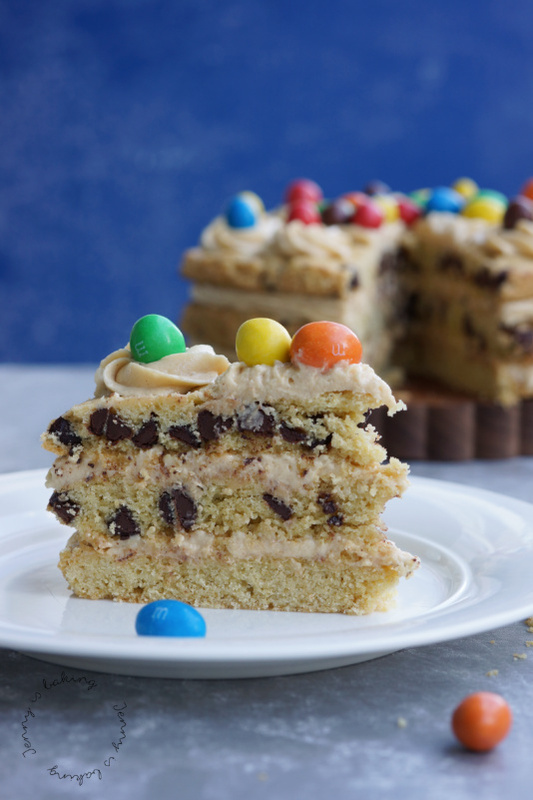 Her August baking challenge is this very same chocolate chip cookie cake. I just invented my own peanut butter frosting and decorated the cake in a more colorful way. Because I love colors. Is this a rich cake? Most certainly. 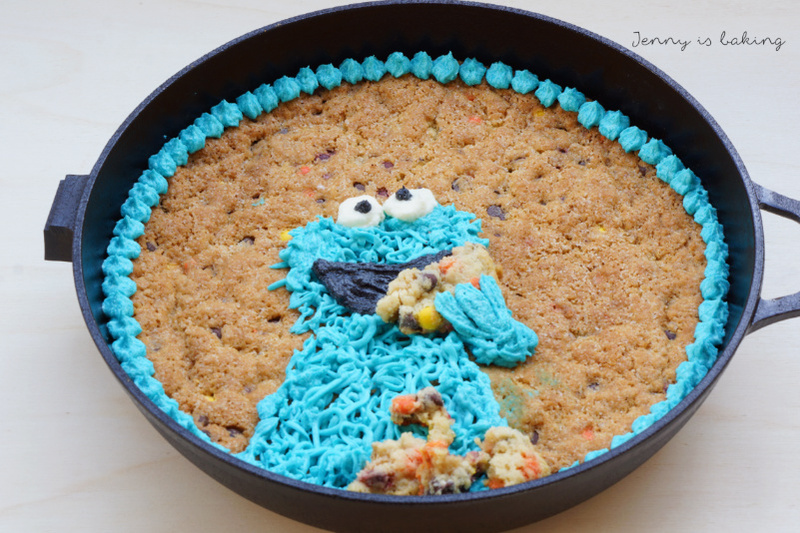 Will you manage to eat more than one small piece of this delicious cookie cake? I doubt it. But regardless, I do recommend this cake for anyone who needs a little cake in their lives. 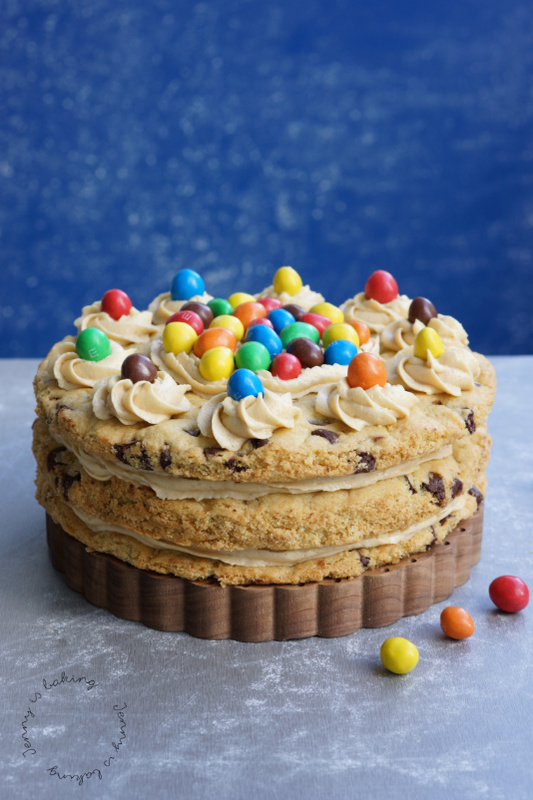 Make this cake for somebody’s birthday, treat yourself to it. You deserve it. The best thing is that it requires little more time than to actually make chocolate chip cookies. The main difference is that you will have to make a frosting and frost the cake. But other than that it is just as simple as the cookie. For the cookie cake preheat oven to 175 degrees Celsius and line three 23/9inch cake pans with parchment paper. If you only have one cake pan, you can bake each layer one after the other. Cream butter with sugars for about two minutes until fluffy. Add eggs, one at a time and vanilla extract and beat until fully combined. Add the dry ingredients and mix until combined. Fold in chocolate chips. Divide dough into three equal amounts and pat down into prepared cake pans. If baking one after the other, keep the dough covered at room temperature. Bake for about 22-25min, edges should be slightly brown. Let cool before assembling. Meanwhile for the frosting mix together flour, sugar and milk in a pot. Heat up while stirring and let boil for about two to three minutes. It should thicken considerably. Let cool. If not using shortly after, place plastic wrap directly on it. Cool in fridge. Beat the butter and peanut butter for about five minutes, then add the cooled off flour mix, one tablespoon at a time. Once everything is combined, beat for another minute. 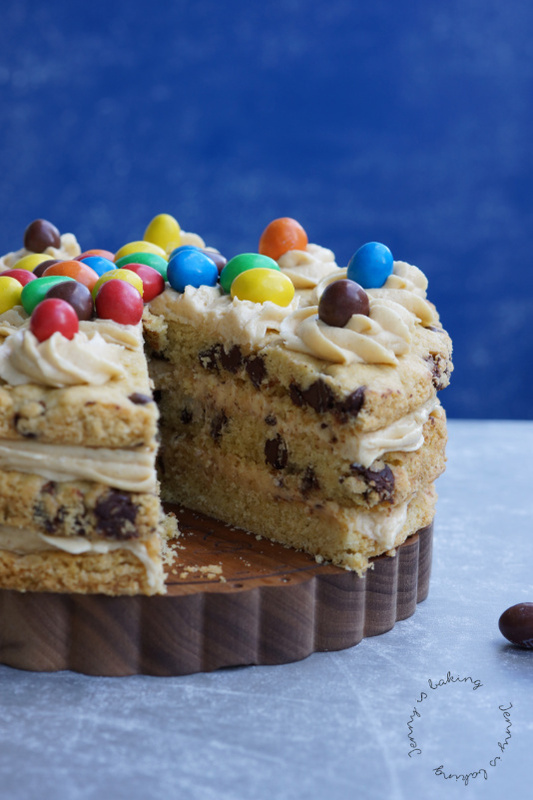 Place one cake layer on sturdy cake board and frost with peanut butter frosting. Place second layer on top, repeat. Pipe circles on top of the last layer and decorate with M&Ms if desired.